A classic, arranged as a mallet instrument duet, playable on one 4 1/3 octave marimba, or any two mallet instruments. Inspired by Turkish folk music, this is an original duet for two marimbas. 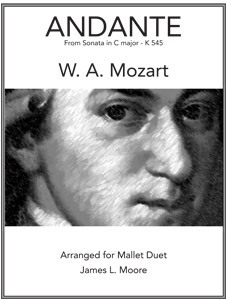 One of Mozart’s most charming and popular piano works, ideal for any two mallet players. A Duet for Vibraphone or Flute and Marimba – this beautiful setting will be a highly effective part of any Holiday performance. One of the best known canonic sonatas by this composer. Can be performed on any two mallet instruments, or by a mallet player and any concert pitch instrumentalist (ex. flute, etc.). This theme and variations on the very well known tune is far from the most difficult of the many arrangements that have been written for nearly every musical instrument, but for only moderately advanced mallet players it is a real winner! Part 1 requires two mallets and a bit of technical skill, while Part 2 requires easy 3 or 4 mallet accompanying skills. Also Part 2 could, if desired, be easily played by a keyboard instrument (piano, electronic instrument, etc.) rather than a mallet instrument. Seven duets using a variety of 20th Century compositional techniques; playable on marimba, vibraphone, or xylophone. A challenging recital work for two skilled mallet players. This fun duet will have your audience singing and clapping along. An ideal selection for a novelty or encore number on your program, Also if desired parts could be doubled and a rhythm section added for larger group performances. 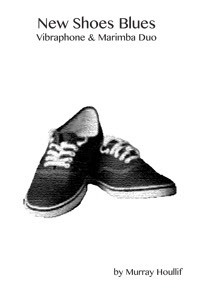 (Performance Set of 2 Books) 24 pp. 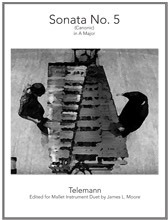 This collection of duets from a variety of musical periods is scored so that two players can play on one 4 octave or larger marimba, or any other combinations of mallet instruments such a marimba and a vibraphone, etc. or even with a concert pitch instrument such as flute or guitar . 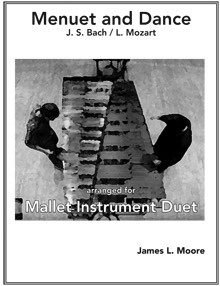 Mallet duet playing is rewarding and enjoyable, and great for developing sight reading skills. Teachers will also find these duets excellent for student/teacher instructional use. Reading and Musicality studies in the form of duets from Al Payson, Principle Percussionist emeritus of the Chicago Symphony. Mr. Payson has arranged these Novice to Intermediate duets so they can be played between any two mallet instruments (Marimba, Xylophone, Vibe or Glockenspiel), or either part can be played with playalong tracks provided below. Al Payson takes an innovative and usable approach to the standard mallet duet etude in Duets for Marimba. The book is a collection of 14 short duets, each only one to three pages in large, easily read- able print. They are mostly adaptations of pieces by well-known composers, with a few originals by Payson. Each piece has a short description of the style in which the piece was written, and any performance notes that the players may need. The first two bars of each piece have a count-off in the time signature of the piece. 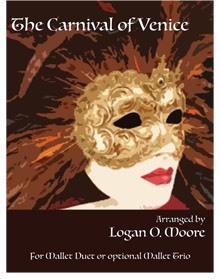 The duets each come with three play-along tracks that can be downloaded free from the publisher’s website. The first track is both parts together, and the second and third tracks are the individual parts. This allows students to learn the piece by playing along to the track containing their own part, and practice playing as a duet with the track playing the second part. This will be very beneficial for students who do not have access to other musicians to gain experience playing ensemble music, and for preparing parts outside of rehearsals and lessons. The parts themselves are beginning to intermediate level, and provide a good mixture of time signatures, keys, styles, and rhythms, including one piece that is swung. 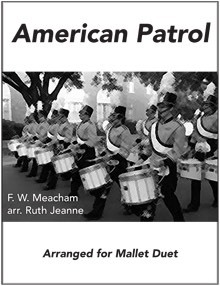 The title indicates that they are duets for marimba, but they could be played on any mallet instrument. Many of the parts could be practiced on a bell kit, making this collection doable for any percussion program or teaching studio. Though some of the parts are truly at a beginner level, some are appropriate for intermediate students. 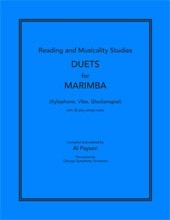 The pieces emphasize dynamics and musicality along with notes and rhythms, and at only $15, Duets for Marimba would be a wonderful and useful addition to any teaching library. Feature your xylophone/marimba players on this medley of old time fiddle favorites. 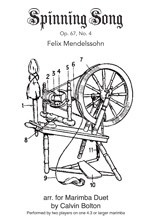 This favorite arranged for two mallet players, can be performed on one marimba or any two mallet instruments(ex. xylophone & marimba, etc.). Fun for two mallet players on one marimba, or any two mallet instruments. Also the lower part can be performed on any bass clef instrument (ex. string bass, etc.). 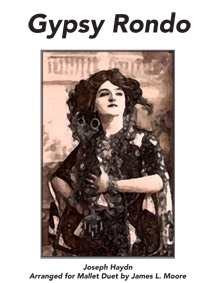 “Gypsy Rondo” is the final movement of Haydn’s Piano Trio No. 39 (piano, violin, & “cello) so named because of its “Hungarian” style. The indicated “presto” tempo will be determined by the skill level of the two mallet players. Advanced players will be challenged to play this duet at a very fast tempo! The player 1 part with slight edits could also be played on other concert pitch instruments such as flute, guitar, etc. And the player 2 part could, with a bit of editing, be played by other concert pitch instruments such as piano, electric keyboard, guitar, etc. 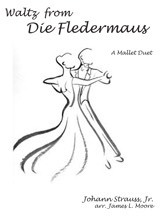 This well known classic is exciting in this mallet duet setting. 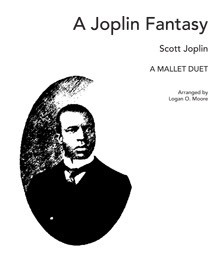 A delightful new arrangement for two mallet instrument players on themes from the great Scott Joplin Rags. This arrangement is fun to play and even more fun for your audience to hear! Player 1 - xylophone, orchestra bells, marimba, & tam-tam; Player 2 - vibraphone. 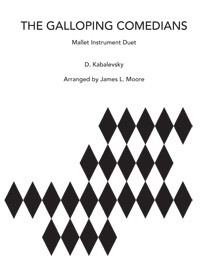 Themes from this classic work are skillfully presented in this fine mallet duet arrangement. An excellent choice for recital or contest performance by two moderately advanced mallet players. A lilting waltz arranged for two marimbas (or any two mallet instruments). performing on one or two instruments. A duet for two marimbas that is upbeat, fun to play, pretty and useable for a wedding ceremony. 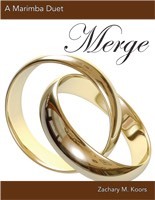 The syncopation and rhythmic exchange is reminiscent of the dance like quality of marriage, as two people are moving through life together in a cohesive unit. The last note, to be left unresolved, communicates that a wedding is merely the beginning to a life-long commitment. 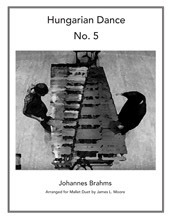 The piece is written for two players on 5.0 octave instruments with 4 mallets each. Listen to a full recording below. Click on You Tube to see a performance. This duet showcases the performing abilities of a vibraphonist and a marimbist. Great introduction to Blues Form. This 3 movement work is one of the most popular and widely played piano pieces written, and it is now available in this fine arrangement as a marimba (or other mallet instrument) duet. Scored so that it can be played by both players on one 4 octave or larger marimba, you can experience mallet instrument duet playing at its very best! This duet is arranged so that it can (and should) be performed on one 4 1/3 or 4 1/2octave marimba. Includes a bit of fancy footwork and crossover playing! In four movements, an excellent recital work. Player 1 plays this tuneful melody on any mallet instrument, while Player 2 plays the 3 or 4 mallet accompaniment. The lilting melodies of these two well known waltzes by the “Waltz King” are beautifully presented in this arrangement for two mallet players. Both parts are playable on one 4 1⁄2 octave marimba, or on other mallet instruments.